The Spanish octopus starter at Grant Grill is a treat for the tastebuds, combining radicchio, anchovy aioli, olives and smoked paprika oil. Spanish octopus recently has become so popular on local menus that we have to wonder if Spaniards are going without. 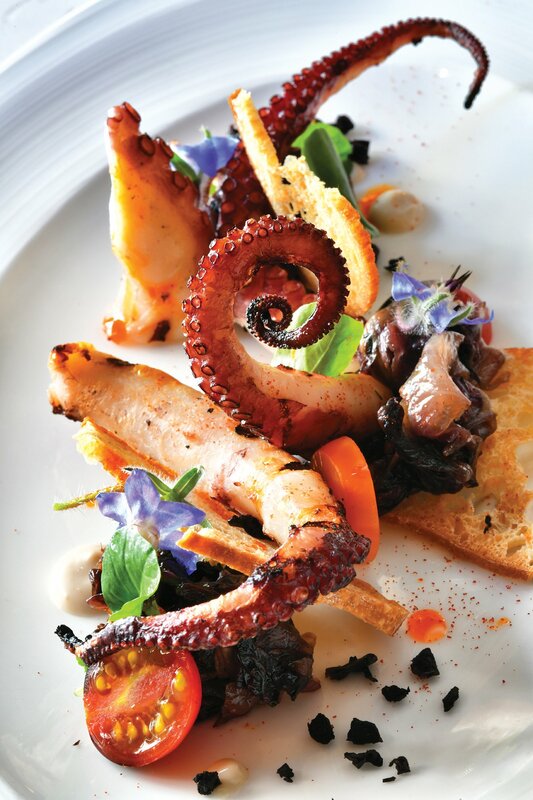 At downtown’s Grant Grill in the U.S. Grant Hotel, which in one incarnation or another since opening in 1951 has been a mainstay of civilized dining, octopus has climbed aboard the appetizer list. Quite carefully cooked, the mollusk is garnished with sharp accents that create a particularly potent presentation. Charred radicchio, bitter as a scorned lover, joins anchovy aioli, choice gordal olives and smoked paprika oil in a sort of flamenco that engages multitudes of taste buds. 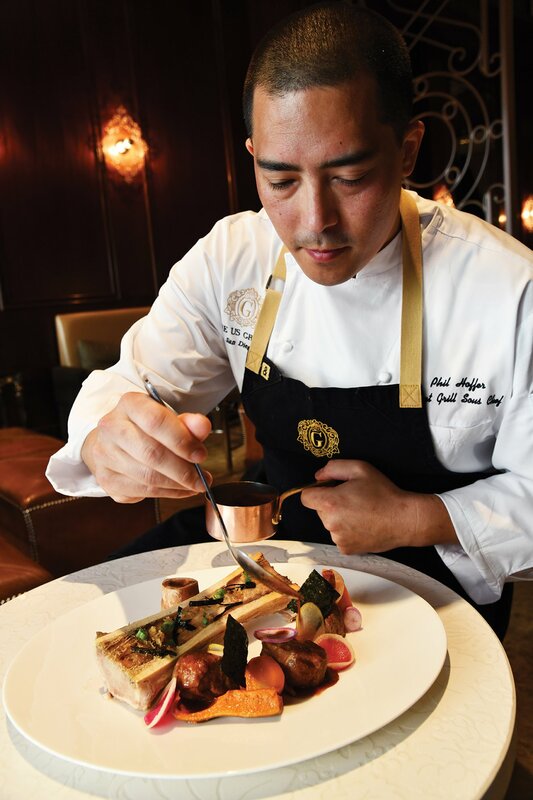 Chef Phil Hoffer, Sous Chef of Grant Grill, puts the finishing touch on a new dish: Korean braised veal shank with bone marrow, Asian pears, honeynut squash and young ginger at Grant Grill. Chef Mark Kropczynski likes to draw influences from around the Mediterranean, but there are exceptions, such as the intensely English starter of braised beef cheek with a Stilton tartlet, caramelized red onion and stout-based mustard. The chef likes luxury, and the day’s soup may be a creamy wonder fleshed out with heirloom tomatoes, lobster and leeks, with a ravishing topping of caviar. Mediterranean accents on the entree list include buttery-textured California spot prawns with Sardinian “shrimp culurgiones,” which are dumplings, and a pan-seared veal chop with caramelized onion puree and sherry. There are always extras like served-in-spoon amuse bouche and wonderful, garlic-brushed bread direct from the oven. To miss the coconut crème caramel would quite miss the point of dining here. In North Park (on 30th Street, where else?) 619 Spirits distills vodkas from cane sugar rather than grain or potatoes, infuses them with such flavorings as rose petals and scorpion peppers and shakes them into cocktails. These can be tasted on a dog-friendly patio where, we suppose, the doggies may also be friendly. 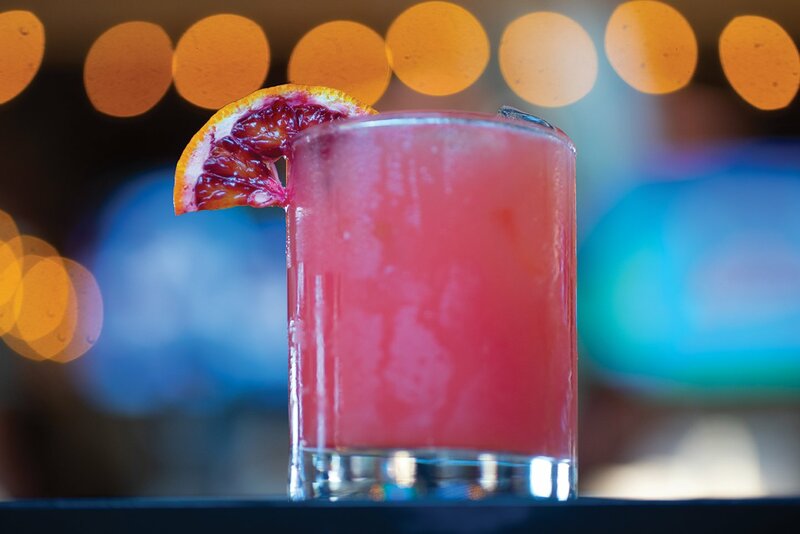 The Blood of the Scorpion cocktail combines 619 Spirits’ scorpion pepper vodka, blood orange and grapefruit juice. WELL-HEELED oenophiles would enjoy the upscale wine list at Gaslamp’s new Route 29, where most of the bottles would be unfamiliar to amateurs. An impressive restaurant in an area that had been losing ground to sports bars, Route 29 guides diners on a journey through California wine country, with wines and a hearty menu that leans unabashedly to luxe. There are novelties, like an appetizer of Buffalo filet tartare served with many flavorings, and a Montana Kurobuta pork chop with apple-cabbage sauerkraut and a caraway-seasoned sauce. Many dishes arrive on bark-edged wood platters. DAVID SPATAFORE, the Coronado restaurateur also responsible for Point Loma’s Liberty Station, has a way with names (Leroy’s Kitchen + Lounge, Stake Chophouse & Bar, Maretalia Ristorante). But the man behind Blue Bridge Hospitality recently raised suspicions by naming his newest island joint el Roy’s Tequila Bar + Kitchen. Leroy’s and el Roy’s? What’s with the Roy, boy? Turns out that Spatafore’s cousin and business partner is Coronado resident Leroy Mossel. TOP BIG APPLE CHEF and restaurateur Daniel Boulud, a boyhood friend of La Jolla’s Jean-Michel Diot and a man whose clientele embraces international society, is losing one of his stars, San Diego-born Travis Swickard, who’s coming home to build a restaurant of his own. The former culinary director oversaw a trio of Boulud eateries and will present his own interpretation of California and Mediterranean cuisines by mid-2019, which in his biz is just around the corner. 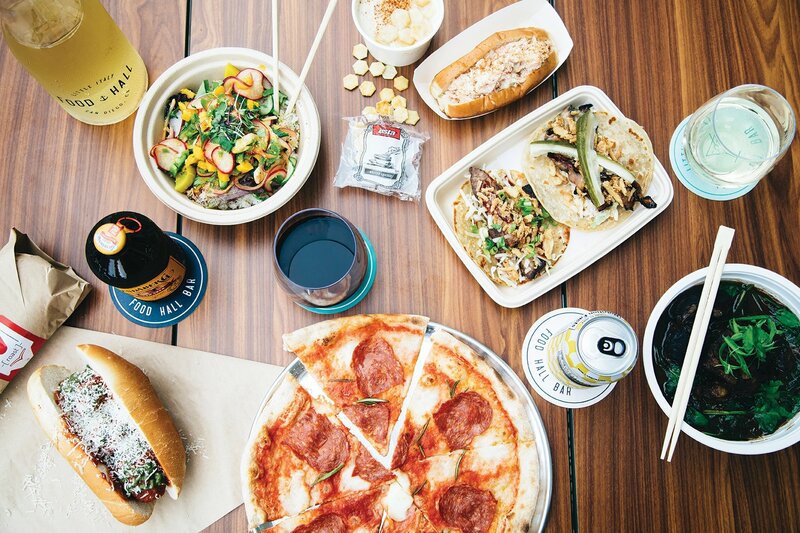 LITTLE ITALY, SO TRANSFORMED as to be unrecognizable to anyone who hasn’t visited in a year or two, is home to the county’s newest dining trend: food halls. At the truly beautiful Piazza della Famiglia on a block of West Date Street, the Little Italy Food Hall boasts a varied selection of eateries, including Single Fin Kitchen and most notably the Ambrogio 15 pizzeria. The upside is choice; the downside waiting in line to order at busy counters.